Vancouver’s North Shore is a destination all unto itself any time of year, but there’s a special kind of magic that happens in the winter. Venture up majestic snow-capped mountains and treat yourself to that Canadian hospitality at world-class restaurants and hotels right at their feet. Here, local mountains are really local mountains. 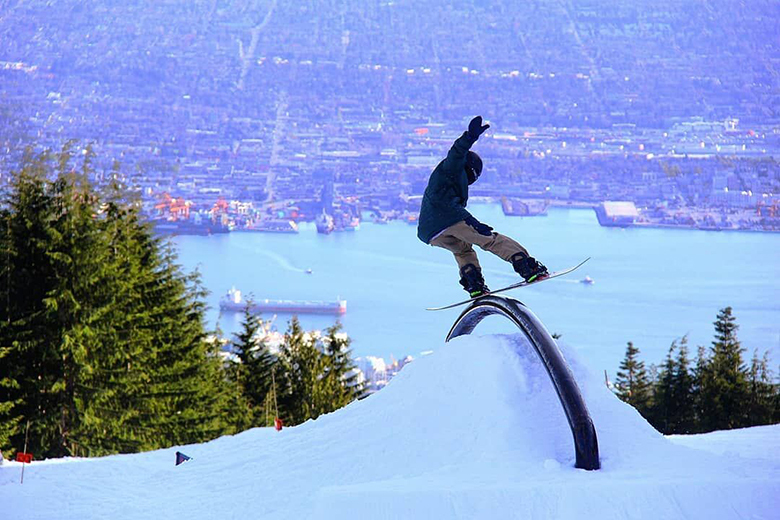 Vancouver’s North Shore boasts not one, not two, but three incredible ski hills just minutes from your hotel. That’s 126 runs on a combined elevation of 7,366 feet of beautiful West Coast powder. And if that’s not enough to make you feel on top of the world, you’ll start your run with a glorious aerial view of Vancouver itself! Don’t fancy hurtling down a mountain on a bit of wax and fiberglass? You can still enjoy the majesty of a North Shore winter on all three local hills on wonderland-worthy snowshoe trails. Channel your inner 18th century fur trapper (you have one, don’t you?) as you make new tracks under towering trees, or book a guided tour past crystalline lakes. It’s easy. No experience necessary and everything you need is available right at the mountain. Imagine yourself for a moment suspended mid-air, gently swaying high above the cool spray of a rolling river. Dizzy? Or intrigued? That’s the question visitors since 1889 have asked themselves stepping out onto the Capilano Suspension Bridge that stretches forest to forest above the Capilano Canyon. High adventure continues throughout the park with a tree-top walk among ancient Douglas firs and the CLIFFWALK outlook. The only question left is, will you look down? One of the great tricks of the North Shore is how quickly you can lose yourself completely in the wilds of a true West Coast rainforest. Lynn Canyon Park makes the magic happen for hikers of all levels. Trails wander through mossy old-growth forests, past emerald green pools, tumbling waterfalls and, if you time it right, rivers teeming with salmon. To complete the spell, stay at one of the nearby hotels so you can get warm and toasty in minutes. For all the exploration the North Shore offers, its culinary scene better match the intense hunger all that adventure stirs. And does it ever. Distinct geography coupled with the deep diversity of the people that call the North Shore home means that dishes created here are fresh, worldly and truly unique. Look, there's no guarantee it’s not going to rain on any given winter’s day on the North Shore. Call it the hazards of a rainforest. Fortunately, the Park Royal Mall provides a perfect “inside day.” With over 250 shops and services housed among original BC artwork, there’s lots to explore for every member of the family. Dine in one of 35 unique restaurants. Get in the driver’s seat to the latest technology in the Tesla showroom. Even take a yoga class. And be sure to bring along your passport, as some retailers will knock 20% off just for visiting BC! No trip to the North Shore is complete without visiting the postcard-perfect village of Deep Cove. Calm, sheltered waters lap against a rocky beach, while lush green mountains call you up to hike their many marked trails. Rent a kayak nearby for an ocean adventure into Indian Arm. When you come back, warm up with a coffee—and maybe the world’s best donut?—at Honey Doughnuts & Goodies, or at any of the other quaint shops and restaurants stretching up Gallant Avenue. After all the excitement of a winter vacation on Vancouver’s North Shore, you’ll head home wondering if summer could ever top it. You’ll just have to come back and find out.